Eligibility Test is for the candidates who are qualified Masters Degree and those who are interested to work as Lecturer or Assistant Professor in College or Universities. HPPSC HP SET 2018 notification has been is released on 22-12-2018. The HPPSC HP SET is a very good opportunity for getting a job in govt degree colleges or university as professor or lecturer. HPPSC will conducting this HPSET 2018 for the available 22 subjects. Online application link for this HPPSC HPSET is active on 23-12-2018 and will be deactivate on 22-01-2019. Online applications only accepted for this HPSET Exam through the HPPSC website of http://hppsc.hp.gov.in/hppsc. More details about this HPPSC HPSET Exam Notification Exam Pattern, available subjects and other details are given below. Candidate must have qualified Masters Degree in their respective subject. If the particular subject is not available in HPSET 2018 you may attend the UGC NET or CSIR NET which will be held twice a year. Candidates who are appeared for final year exam and waiting for results they are also eligible for applying HPSET of HPPSC. There are total 22 subjects are in this Himachal Pradesh State Eligibility Test for Assistant Professors in the streams of Science, Arts and Humanities. Depends for number of candidates appearing for this SET Exam center will changed. Candidate can pay the fee using E chalan or E payment option. HP SET exam will be conducted for 350 marks and consists of 3 different papers. 3 papers are objective type only. There is no negative marking in this HP SET 2018 Asst Professors State Eligibility Test. Syllabus will be same for UGC NET. Paper 2 and Paper 3 Syllabus will be from the selected subject. 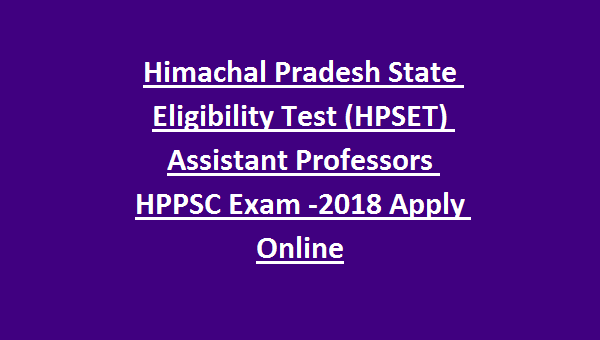 Candidate who are qualified Masters Degree in the above given any one of subject they are eligible for applying this Himachal Pradesh PSC State Eligibility Test 2018. Submit your application form online for this HP SET 2018 Exam on or before 10-01-2019 through http://hppsc.hp.gov.in/hppsc website. Click here to apply online for HPPSC HP State Eligibility Test HPSET 2018..